About Author / design / website The Ginkgo Pages / photos-videos (unless indicated otherwise): Cor Kwant. Education: English and Dutch at VU University Amsterdam. I am a high school teacher and live in Amsterdam, the Netherlands, Europe. More information about this website's history and contributors: click here. Cindy Q. Tang et al. Identifying long-term stable refugia for relict plant species in East Asia. Nature Communications| (2018) 9:4488. Jiang, Z. et al. A Jurassic wood providing insights into the earliest step in Ginkgo wood evolution. Scientific Reports 6, art.no. 38191, Nov./December 2016. Rui Guan et al. 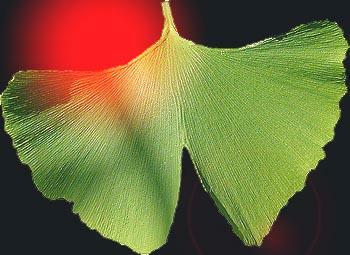 Draft genome of the living fossil Ginkgo biloba. Journal GigaScience, November 2016. Cindy Q. Tang The Subtropical Vegetation of Southwestern China, Plant Distribution, Diversity and Ecology , Springer 2015. Nagata, T., A. DuVal, and P.R. Crane. Engelbert Kaempfer, Genemon Imamura and the origin of the name Ginkgo. Journal article: Taxon 64.1 (2015): 131-136. Peter Crane Ginkgo: The Tree That Time Forgot Yale University Press, 2013.In this book Peter Crane mentions my Ginkgo website a most important key resource: Citation. Peter Crane et al. 773. GINKGO BILOBA – Connections with people and art across a thousand years Curtis's Botanical Magazine: Volume 30, issue 3, 2013, pp. 239-260. Shen, L., X. Y. Chen, X. Zhang, Y. Y. Li, C. X. Fu & Y. X. Qiu Genetic variation of Ginkgo biloba L. (Ginkgoaceae) based on cpDNA PCR_Rflps: inference of glacial refugia. Heredity 94, 2005, pp. 396–401. Birks J, Grimley Evans J, Van Dongen M Ginkgo Biloba for Cognitive Impairment and Dementia (Cochrane Review) The Cochrane Library, Issue 2, 2003. Oxford. Update: Birks J, Grimley Evans J, Lee H. Ginkgo biloba for cognitive impairment and dementia. Cochrane Database of Systematic Reviews 2007, Issue 2. Art. No. : CD003120. DOI: 10.1002/14651858.CD003120.pub2. Van Beek T Ginkgo Biloba part 12 in the series Medical and Aromatic Plants - Industrial Profiles, Harwood Academic Publ., Amsterdam, 2000/Roland Hardman, updated edition: Taylor & Francis, 2006. Download updated edition. Ernst E, Pittler MH Ginkgo biloba for dementia: a systematic review of double-blind, placebo-controlled trials. Article in: Clinical Drug Investigations 1999; 17(4): 301-308. Blumenthal et al. The Complete German Commission E Monographs—Therapeutic Guide to Herbal Medicines. Austin: American Botanical Council; Boston: Integrative Medicine Communications, 1998. For more information and scientific publications please check out my Links-page, online bookshops etc. Famous poem about the Ginkgo. In 'West-östlichen Divan' (book Suleika), 1819. Read the poem and info: click here. about the aftereffects of witnesses to violence and survivor guilt in the children of Holocaust survivors. 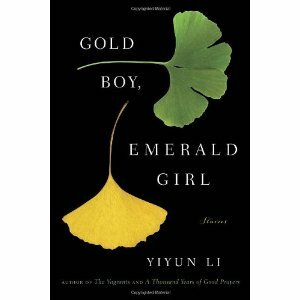 Ginkgo on the cover and in the book. 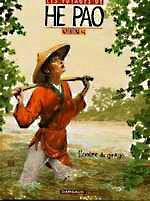 304 pages ; Publisher: Ballantine Books (Trd); August 28, 2001.
about the lives of 3 generations of a family in China. "In spring, the school was a sea of pink because of all the peach trees. But what I liked most was the two-story library, built in the traditional Chinese style. The building was encirded on both floors by loggias, and the outside of these was enclosed by a row of gorgeously painted seats which were shaped like wings. I had a favorite corner in these "wing seats" (fei-lai-yi) where I used to sit for hours reading, occasionally stretching my arm out to touch the fan-shaped leaves of a rare Ginkgo tree. There was a pair of them outside the front gate of the library, towering and elegant. They were the only sight that could distract me from my books." 524 pages ; Publisher: Anchor World Views; Reprint edition November 1992. A man's obsession drives him to search for the perfection of youthful beauty in the women he follows. Dark novel with use of stream of consciousness devices and free association. Ginkgo trees mentioned in the book. 168 pages; Publisher: Kodansha International; 1955. Ginkgo mentioned in the book. Falling Ginkgo leaves mentioned in the book. 'Pale fire' by NABOKOV V.
Ginkgo images on the cover and in the book. Boudewijn Büch writes about his passion for the Ginkgo on pages 117-120: "Ik heb tientallen blaadjes van de boom uit alle mogelijke windstreken meegenomen, maar toch kan ik het niet nalaten nóg meer blaadjes naar huis te slepen. ...Het is vooral de magie van dat prachtige gedicht van Goethe dat mij tot de boom veroordeelde." Ginkgo, a little tree, is in love with Moon, but Moon is too busy chasing the light of the dazzling Sun to notice, until Gingko overcomes Sun's efforts to overshadow him and captures Moon's attention, a tale of the beauty of nature and love. Ginkgo and willow in the poem. Read poem and info here. 192 pages, Publisher: Bantam Books; December 1986.
poem about a Ginkgo in Granada, Spain (1996). Exchanged poems about the Ginkgo in the 11th century in China (Sung dynasty). These Japanese poets wrote verses about the Ginkgo (first half 20th century). T. Shimazaki, 'Hakai' (novel, 1906), 'Icho no Ki' (juvenile story, 1917). S. Natsume, 'Sanshiro' (novel, 1914). R. Akutagawa, 'Hana' (a short story, 1916). K. Miyazawa, 'Icho no Mi' (juvenile story). K. Nakamura, 'Kamakura Monogatari' (Stories of Kamakura, about 1659). "Ooit had ze hem meegenomen naar de Vespuccistraat om hem de ginkgobomen te laten zien, die aan beide zijden van de straat staan: elegante, grillige en sierlijke bomen. Japans, noemde ze die uitheemse bomen en ze had hem de waaiervormige blaadjes laten zien. Onder geen beding had ze door de straat willen lopen. Ze had hem de bomen vanaf de hoek getoond en verteld dat het jarenlang die bomen waren geweest, die betoverend mooie bomen, die haar de hoop hadden gegeven dat haar leven ooit op een wonderbaarlijke, onbegrijpelijke en niet voor te stellen manier zou veranderen." A temple near the hypocenter of the atomic blast at Hiroshima was disintegrated, but its Ginkgo tree survived to bud and bloom. The poet Arthur Sze extends this metaphor of survival and flowering to transform the world's factual darkness into precarious splendor. History of the Ginkgo tree (youth book). Ginkgo paintings and photos on the cover and in the book. Stories. Ginkgo images on cover and mentions in the book. Random House, 2010 - 240 pages. Fantasy epic and romance, directed by Park JeHyun. Beautiful scenes featuring Ginkgo leaves/tree. by Ben Wagin, artist in Berlin. "Right from the start I had wanted a 'bit of nature' to be present. In all her novels Iris Murdoch suddenly flings open the windows of Hampstead or the Gloucester Road and through some wangle of the plot (Five Go Off To A Sanatorium) the characters escape to the countryside, which enables the writer to show her unrivalled sympathy with the world of living things, especially the plants of the English hedgerows. To have featured an iris would have been too dumb. At our second sitting I made a wild guess and suggested a Ginkgo, and it turned out that we were both enthusiasts for the world's oldest tree. Luckily there is a fine specimen in my own garden and towards the end of the sittings I therefore put in a Ginkgo branch, painted in the manner of old botanical illustrations: I first made a separate study of it in case it might die. In the end the branch in the picture was painted directly from nature though slightly adapted to rhyme with other elements in the painting, like the collar, and the arm of Apollo." Enlargement and more info click here. Work record of the photographer Irving Penn. 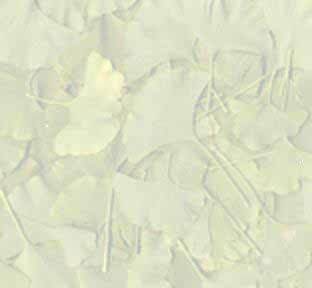 On the cover photo of Ginkgo leaves taken by Penn in 1990. Published by Alfred A. Knopf in New York in 1991. 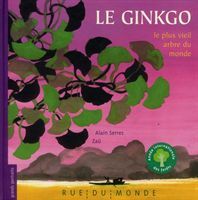 Ginkgo image on the cover. A popular account of the status of global biodiversity at the beginning of the 21st century. "Science book of the Year 2000" in Germany and awarded a "Distinctive Merit" by the New York Art Directors Club. Berlin Verlag, Berlin 2000 - 288 pages. English version Grove Atlantic, New York, 2002. If you have information to add to this page please email me.